In northern Maine, where I have lived for the past 10 years; there are two Native American tribes; one of which is the called ‘Maliseet’, the other is ‘Micmac’. 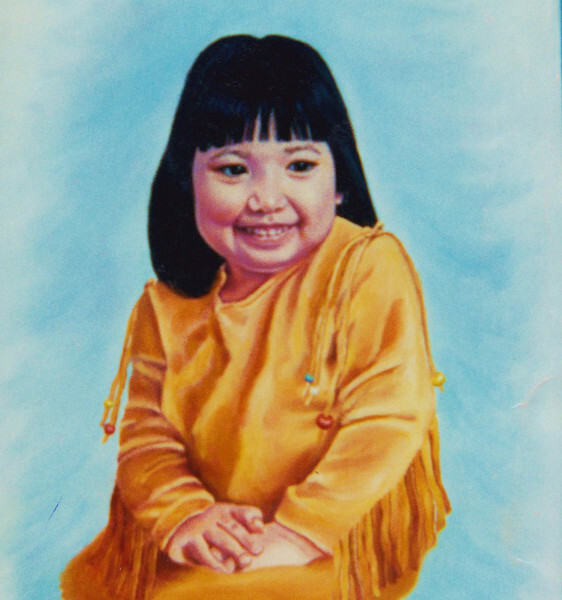 I never met this little girl, however; I thoroughly enjoyed doing this painting of her in her hand-made, traditional cowhide dress. Aside from being an adorable subject, I was struck by her happy, almost contagious expression; which to me almost looks as if she is about to burst out laughing or that she is trying to keep herself from revealing a secret. For information on how to have my commissioned portrait of your 2 or 4-legged family member, painted…or one of, or for a special person in your life, Click here to go to my How to Order a Commissioned Portrait page. You can also go directly to my Oil Painting Prices page. Click here to purchase other paintings by ARTISTkarin.